Left Bank is at its core a New York bistro, inspired by Greenwich Village itself, and influenced by European sensibilities. From our landmarked building in Manhattan's historic district, large bay windows on both sides reflect our open-book, unpretentious style of cooking and service. Our food is inspired by our local farmers, recipes of days gone by, and the relationships we have with our guests. Left Bank continues to evolve with an entrepreneurial spirit and a sincere desire to serve simple, wholesome, delicious food and drink to New Yorkers and passersby. We are now open for brunch on Saturdays and Sundays. We do both on and off site, full service catering. We have the professional know-how to help make your event all that it can and should be. The restaurant may be rented for a private party. Also, consider our Private Cellar for parties of 20 people or less. We do both on and off site, full service catering. We have the professional know-how to help make your event all that it can and should be. Street parking plus a public parking garage located right across the street! Since our opening in 2011, we have hosted corporate holiday parties, bridal showers, business conferences, wedding receptions, birthday parties and anniversaries to name a few. Consider our Private Cellar for parties of 20 people or less. Email micheline@leftbanknewyork.com, or call 212.727.1170 to get the ball rolling. Poor menu. No flavor on salad. Bread expensive add-on. No ham. No almond milk. Great ambiance, but the food was a bit salty the last time I visited as well as this time. However, the food is very fresh and delicious (better with less salt). Recommend especially their happy hour. the food is too. I can't remember if there is a good chicken dish on the menu, Either fried or baked. I have recommended the restaurant and will again in the future. Love the guest chef program. Love the regular chef as well, so it's a wonderful combo. Bad service, maybe because it was during restaurant week, but good food. The hostess was awesome - very friendly. The guest chef stopped by our table to tell us about the dishes he was creating and then again to see if we were enjoying the meal. Our water was just the right combination of familiar and professional. We came here for restaurant week and will certainly be back. Our waitress gave us great recommendations when we asked and helped us pick a delicious bottle of Pinot Noir. I wouldn't normally order roast chicken but it was some of the best either of us have ever had. It's not too loud, dark or expensive. I will for sure bring my parents here on their next visit. This place was just awesome. Will be back many times. 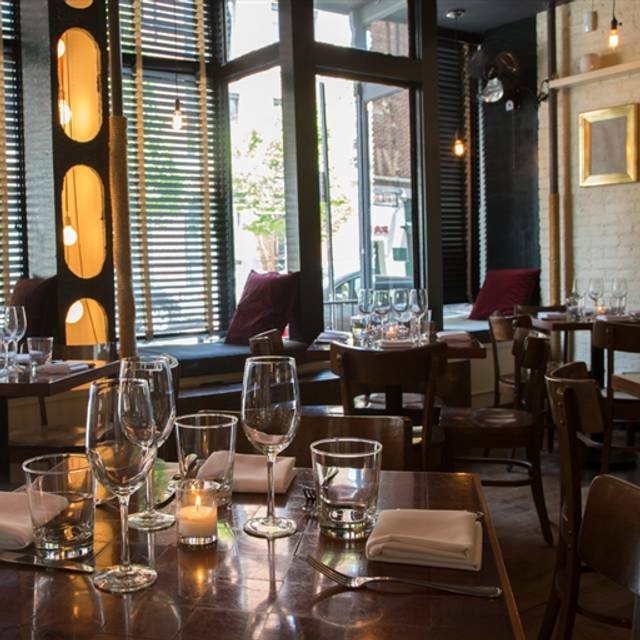 Left Bank is a charming local West Village spot. Food is wonderful, servers are friendly and ambiance is very inviting. Highly recommend. Our timing was perfect for pre-theatre and we left before the younger more energetic crowd arrived. Worked for everyone. Delightful and will absolutely return! Great food and really fun servers! Always great. Love this place every single time. Service is flawless. This is the second time we've been to this restaurant together and we have enjoyed our meal and experience both times. Most recently, we made a last minute reservation for Christmas Eve. Even after receiving a call from the restaurant about how we were able to make a reservation at that time [remember that it was Christmas Eve], they absolutely were happy to honor our reservation and welcomed us openly. Our food was delicious, service amiable and not rushed. Even though we were the last table seated for the night, our food was served at a comfortable pace. We could enjoy our food, our conversation, and taking our time. He mad the mussels with fries, and it was a huge dish, and yet he enjoyed it a lot. I had a pulled chicken dish with celery root that was delicious. We both enjoyed the parsnip and apple soup. Perfect for a cold and windy night. Cocktails were just right. One of the real gems of West Village dining! Each year for the past four or five, we spend Christmas Eve here. The fabulous food, interesting cocktails, ambiance, and terrifically knowledgable and friendly service have kept us coming back for years. Bravo Left Bank! Christmas Eve. The food was superb, especially the pulled chicken with frizzled onions. Perfect evening and great service! Our first visit, and we would definitely go back. Flavourful food, perfect device and a relaxed atmosphere. Our extended family went for an Xmas Eve dinner and had a splendid time. Bobby and his team made us feel so welcome. Excellent food and service. We will be back and strongly recommend. I've been to Left Bank a few times and recommend it. It's a quaint restaurant where the food and service is always good. It's not a huge menu but they cover all bases (meat, fish, veggies). I like that it's a smaller, more intimate locale. EVERYTHING WAS XCELLENT. However acoustics were poor and very loud at 8pm on a Friday nite! Lively and friendly ambiance on a Thursday night. Food was imaginative, tasty, and not crazily priced for what it was. As with many Manhattan restaurants, I found the space between two-tops to me the stuff of comedy. There really was no way to even slide between tables to sit down without dipping your sleeve into the neighbor's sauce. If they're going to do it communal style, they should just advertise it as such. However, they were easy about switching to the bar where service was great and the atmosphere cheerful. My go-to spot for just about any reason. Happy hour, spontaneous dinner, or big work dinner. This place never disappoints and impresses the pickiest of people. It feels like a hidden treasure - not sure if that’s true - but I’d like to think so. We randomly decided to go to dinner in the West Village without making a reservation (risky). We stumbled upon Left Bank and they had plenty of seating. The food was on point. I had the PAPPARDELLE ALLA BOLOGNESE, SLOW COOKED BEEF & PORK RAGU and my husband had a burger. The pasta was amazing. My only hesitation is the prices. For a burger, pasta, a "squash salad" which was literally just seasoned squash, a beer, and two glasses of wine (all at happy hour prices) we paid over $130. If you don't mind dropping that on a quick dinner then this place is good for you. But you can find exceptional menu items at the same price, or less, if you make a reservation in advance, somewhere else. Excellent meal, wonderful staff. Would go back in a heartbeat. We were in town for Thanksgiving and needed to find a place in the neighborhood for Sunday brunch. I am not a fan of waiting in line to eat so I chose Left Bank NYC mainly because I could get a reservation at the time we needed. What a wonderful surprise! It has a very neighborhood-y feel, and was very cozy. We were meeting our son who works nearby and had loads of luggage, which the staff was very gracious about. In fact, everyone there was incredibly friendly, and our food was perfect. My son and I loved the avocado toast, bacon and sausage, and my husband’s burger was excellent. We enjoyed lingering after our meal, and did not feel rushed at all. A very relaxing end to our stay! We went to the Left Bank for Thanksgiving dinner. The hot toddies were perfect for a warm upon an unusually cold day. From the moment we arrived, we were welcomed. Our waiter was divine and the food perfect. We would definitely recommend to others. We were in town for Thanksgiving. Found a good review online, so booked a table. The food was amazing. Not just really good, it was amazing! We eat very well at home, but this was over the top. Loved it! The pre dinner cocktails finally arrived, but WITH the dinner!!!! Chaos and no festive Thanks Giving moments. This is a favorite local go to. Great food but a little overpriced. An old friend and I had a wonderful dinner experience at this classic village venue. Food was superb, service friendly but not overbearing. Places like this - comfortable and elegant, with a civilized level of noise - seem to be far and few between these days. We had to go back a second time during the week. Every dish was marvellous and great service - thank you Natalie. Great organic wine options. Great job! I love this place -- which is why I keep going back. Loved, loved, loved Left Bank!!!!!!!!! Will definitely go back to Left Bank soon! This is a good neighborhood place. The first time I went there because I don't live close by. The menu is limited so look at it before making a reservation. Mostly pastas and a few other entrees. Nice appetizers and friendly staff. Amazing. The food was outstanding. The waitstaff was friendly. The wine and cocktails were all perfect pairings for the meals. Great neighborhood spot with good food! Good specials too! Left Bank is always a welcoming place. As soon as you walk in the staff is warm and accommodating . It is my to to place for incredible home made pasta, and the best chicken in town. The menu changes, but there are some staples that may have new iterations. I , for one, and crazy about the chopped liver bruschetta , with garlic butter and walnuts. Right now there is leek , bean and parmesan rind soup, that I can't wait to go back for. The brioche perdu, with creme fraiche and gelato is definitly something I look forward to having again !